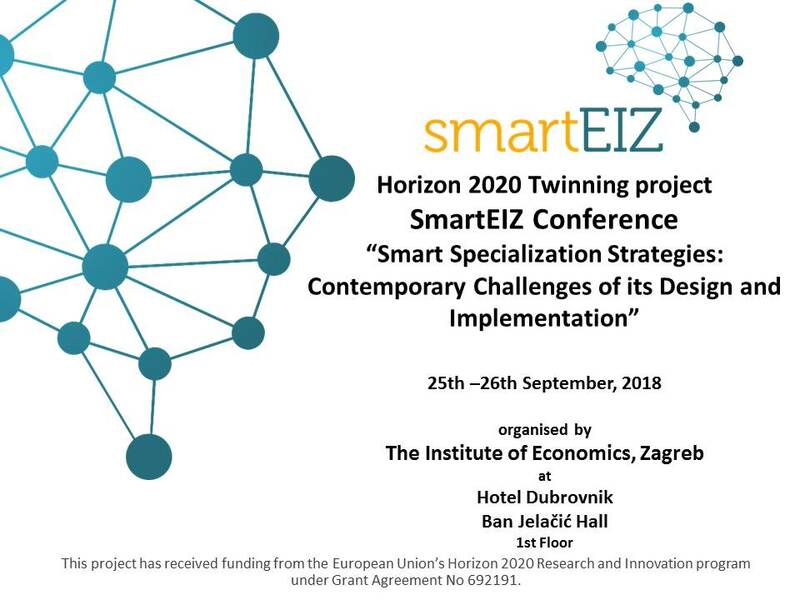 SmartEIZ Conference titled “Smart Specialization Strategies: Contemporary Challenges of its Design and Implementation” was held in Zagreb on 25th and 26th September, 2018. It was organized by The Institute of Economics, Zagreb SmartEIZ project team members. Over the past period, the Smart Specialization Strategy has become a binding strategic document for all EU member states on the basis of which it is necessary to plan spending of EU funds from the Structural Funds and the Cohesion Fund, which also includes programs that include research, development and innovation activities . For this reason, the implementation of this Strategy requires the coordinated action of all stakeholders involved in this process: state administration, business sector, civil society and the scientific community. The two-day conference was inaugurated by the Minister of Economy, Entrepreneurship and Crafts Darko Horvat, State Secretary at the Ministry of Science and Education Tome Antičić and the Director of the Institute of Economics, Zagreb, Maruška Vizek. The SmartEIZ project “Strengthening the scientific and research capacities of the Economic Institute, Zagreb as the foundation of Croatian socio-economic growth through the implementation of the Smart Specialization Strategy” is funded from the Horizon 2020 programme and conducted by researchers of the Institute of Economics, Zagreb, together with partners from the following Bocconi University Italy, UNU-MERIT from the Netherlands and University College London (UCL) from the UK. SmartEIZ is implemented in partnership with the Ministry of Economy, Entrepreneurship and Crafts and with the Croatian Agency for Small Business, Innovation and Investment (HAMAG-BICRO), whose representatives are in the Project Steering Committee. Thanks to this kind of project organization, foreign partners provided insights into the latest trends and knowledge in the area of innovation policy, which is crucial for the implementation of the Smart Specialization Strategy. The conference presented works that represent the experience of implementing the Smart Specialization Strategy across Europe as well as research papers on innovation and industrial policy. A round table was held at the end of the conference on “How to implement the Smart Specialization Strategy?”. Participants with international experience shared their experience with the implementation of the Strategy on the examples of their countries, which is relevant for the effective implementation of this Strategy in the Republic of Croatia. Bart Verspagen, Is job automation risk traded in the European Union? Alasdair Reid; Where To Now For Smart Specialisation: Is Sustainable The Only Smart Direction? Mona Ramon, Henry Varga, Alasdair Reid, Vladimir Cvijanović; Quadruple Helix Models For Territorial Entrepreneurial Discovery Process: How To Engage The Civil Society In The Participatory RIS3? Will Bartlett, Besnik Krasniqi, Jasmina Ahmetbasic; Attracting FDI To The Western Balkans: Does Government Support For Special Economic Zones Inhibit Smart Specialization?